Referring to the student protests that “rocked” South Africa towards the end of last year, and the fact that some commentators suggested that the country’s “Arab Spring Moment” had arrived, Satgar points out that the students themselves were using the discourse of the revolution. He also insists that in the context of global neoliberal restructuring, “‘revolutionary nationalist,’ ‘communist’ and ‘social democrat’ are all anachronistic labels and meaningless slogans to the generation of youth rewriting history through their recent protests”. Satgar is the co-editor of the recent KMM Review publication Cosatu in Crisis: The Fragmentation of an African Trade Union Federation. After World War II, national liberation politics captured much of the left imagination. 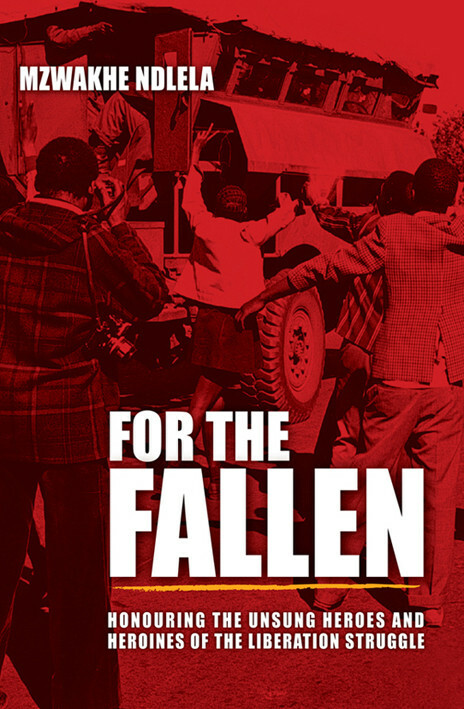 For the South African liberation movement, the 1980s were decisive years in which the internal and external movements consolidated their struggle against the apartheid state. The future seemed poised for a radical alternative. What is often not acknowledged, however, is that national liberation politics was actually exhausted by the 1980s (Armin, 1994: 105-148). The Bandung project’s anti-colonial and revolutionary nationalisms came unhinged by their own internal limits and the shifting relations of imperial force. This crisis of national liberation politics existed alongside the collapse of the Soviet Union. Moreover, the neo-liberalisation of social democracy forced the left into defensive struggles to protect gains achieved under Keynesian–welfare capitalism. Since 1980 global neoliberal restructuring completely remade the ideological and political landscape. The defeats endured by the left in this conjuncture added to the confusion of left politics and identity. Coupled with earlier horrors, strategic defeats and political shortcomings this further contributed to the left’s discredited 20th century inheritance. In this context, “revolutionary nationalist” “communist” and “social democrat” are all anachronistic labels and meaningless slogans to the generation of youth rewriting history through their recent protests. In this article, I look at the crisis of the South African left and explore the possibilities for its renewal. 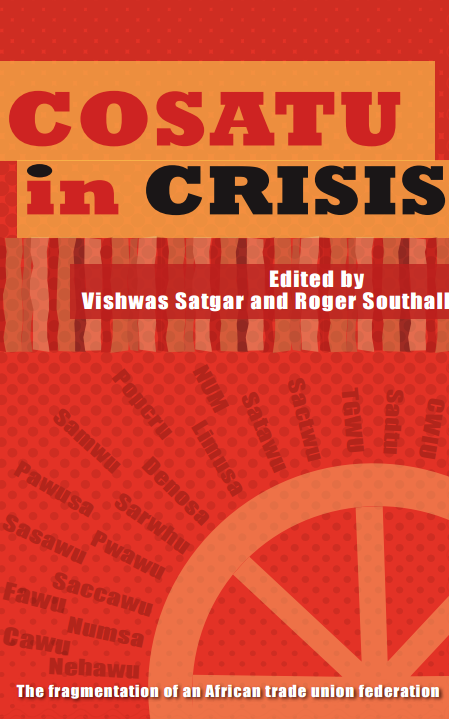 The Pietermaritzburg Chamber of Business hosted the KwaZulu-Natal launch of Cosatu in Crisis: The Fragmentation of an African Trade Union Federation, edited by Vishwas Satgar and Roger Southall. 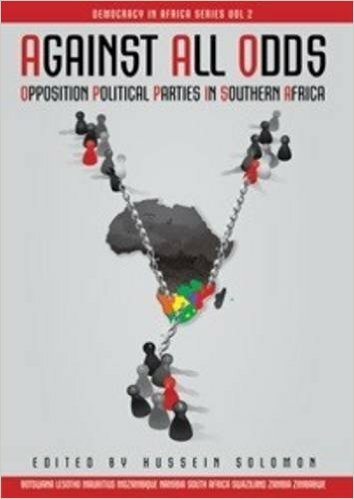 The forward to the book is written by former Cosatu general secretary Zwelinzima Vavi, who was in attendance at the launch and reportedly did not pull any punches. Vavi compared the collapse of Cosatu with what he termed “the slide of our country towards a failed state”. [Vavi] described a subversive agenda, and how organisations that have raised reservations about our current leadership have been reorganised and how dissenting voices have been “managed off the scene” and replaced with a “choir of praise singers”. He stated that the collapse of Cosatu was designed, and that sadly, all that the powerful families and people in government currently cared about, was securing opportunities to “feed at the trough”. When asked what role business should be playing, Vavi wasted no time in saying that business leaders needed to complain loudly about corruption and the crisis in our government, lest they be remembered for having been complicit in the downfall. “Our country”, he said, “is a ticking time bomb”. Former IEC Chairperson Brigalia Bam delivered the annual Chief Albert Luthuli Memorial Lecture recently. The lecture was held at the University of KwaZulu-Natal in Durban. Luthuli was a teacher and activist, and became the president of the African National Congress. He was awarded the 1960 Nobel Peace Prize, becoming the first African to be awarded the prize. Bam said it was important remember to remember that, as an activist, Luthuli remained deeply involved in his community as a spiritual leader. “He is comparable to other world leaders that we know, like Mahatma Gandhi, Martin Luther King Jr, Mother Theresa, the Dalai Lama, and others,” Bam said. There is a rather one-sided, reductive and commonplace perception that South African President Jacob Zuma is a dangerous man. Included in this is an assertion that the fear of Zuma is what brings together the #ZumaMustFall campaign to have him fired. But what stands on the other side? Well, a real country that is distrustful, dangerous and angry; ultimately a citizenry afraid of itself and one another. In generalities, whites are perceived as untransformed oppressors, greedy, uncommitted to genuine reconciliation, and blacks as failing, criminal, and inferior. These are racist stereotypes keeping South Africans apart and mediating social relations. But yet everyday reality is much more complicated. An inbetween exists of deracialising spaces, institutions and transforming social relationships. But it is getting lost. This is the governing African National Congress’ failed “rainbow nation” project. At the same time, re-racialising dynamics are engendering old and new faultlines. Both potential and actual non-racial social relations have taken root over the past two decades. But deep racial divides in South African society are eclipsing these due to the ANC’s shallow nation-building efforts. #ZumaMustFall is challenged by these realities and can only go forward if it embraces a radical approach to non-racialism. The collective unconscious of the #ZumaMustFall is, ironically, about reconnecting with the desire to be a country transformed in race, class and gender terms. It is about a courageous attempt to find a non-racial solidarity again, to reaffirm a common vision and journey towards a secure future. But is this imputing too deep a meaning to the cyber-chatter and street politics of #ZumaMustFall? those who want a stable, working democracy. The #ZumaMustFall campaign is not just a big tent but also an open signifier with multiple symbolic meanings. Its true potential lies in turning what is unconscious desire into conscious political solidarity and a radical non-racialism that the ANC failed to realise. It is about achieving genuine reconciliation and transformation. Without this ambition it will not go very far and will not enable South Africans to overcome the fear of themselves. Without this ambition it will harbour a minority of white racists. Without this ambition it cannot beat Zuma’s ANC. This is also a challenge for the students’ #FeesMustFall campaign. Also, its potential as a force for change also derives from the genesis of its rage. For many commentators, #ZumaMustFall begins with the recent sacking of finance minister Nhlanhla Nene. If this was the case then the re-appointment of Pravin Gordhan would have pacified this multitude. The move certainly pacified the markets, but not the mass anger. Instead, several street protests took place across different locales and there is immense potential for more. 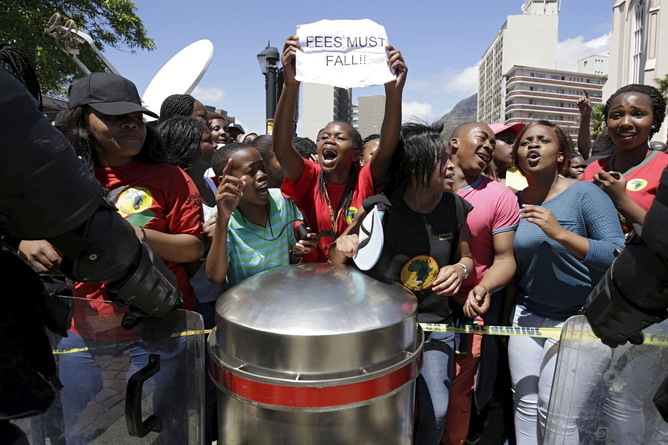 Students protest over planned increases in tuition fees outside South African parliament in Cape Town. The #FeesMustFall and #ZumaMustFall campaigns come from the same place. The rage has its roots in opposition to the Zuma class project. The project is about surrendering national sovereignty through globalising South African capitalism, while a political class controlling the state and tied into Black Economic Empowerment captures rents at the expense of the majority. The project has failed in two respects. The first is due to economic insecurity and desperation. South Africa’s workers and middle class are feeling the weight of increasing costs while inequality and indebtedness has increased. All of this has come in the context of a contracting economy and increasing unemployment with no hope or expectation of change from above. This is confirmed by the government’s austerity response. There is a disconnect between South Africa’s rulers and the needs of citizens. Second, Zuma ascended through an authoritarian populist politics. The cult of Zuma merged with the presidentialising of power that existed under Thabo Mbeki, his predecessor. This has given license for the destruction of key institutions, such as the National Prosecuting Authority, and the undermining of the Public Protector’s authority, as well as brazen patronage-based corruption. This has shifted perceptions among sections of South Africa’s working and middle classes, particularly through the Marikana mining massacre, the Nkandla scandal involving the use of public money on Zuma’s private homestead, attempts to undermine rural women’s citizenship and the destruction of the Congress of South African Trade Unions, the ANC’s governing ally. Through #FeesMustFall, student and worker alliances are saying enough is enough to the outsourcing of work, the undermining of worker rights, and commodified education. At the same time, increasing sections of the working and middle classes are deeply concerned about economic insecurity and the crisis of democratic constitutionalism. There is common ground here. The reckless sacking of Nene merely unleashed another popular expression of simmering anger against a crisis-ridden, increasingly authoritarian and deeply corrupt mode of neoliberal governance. This situation also opens up the possibility for #FeesMustFall and #ZumaMustFall to find a radical, non-racial convergence and, in class terms, for the working class and middle class to share common interests. South Africa’s cybersphere is becoming part of its democratic politics and its democratic politics part of the cybersphere. Social media is now part of its protests. It extends South Africa’s public sphere and creates a crucial infrastructure for affirming democratic citizenship. Mass politics is being remade in a way which not only challenges the dominant ANC but also institutional opposition parties. #ZumaMustFall, like #FeesMustFall, took the country’s institutional parties by surprise, prompting them to opportunistically jostle around the multitude to find a place. The monopoly of the opposition Economic Freedom Fighters of being anti-Zuma was completely undercut and eclipsed. #ZumaMustFall together with #FeesMustFall opened up a new strategic way forward for mass opposition to the ANC and its Zuma class project. In other words, both #FeesMustFall and #ZumaMustFall are at the same time about #ThePeopleMustRise and are showing a way forward to end the fear of ourselves. This comes with its limits and challenges. But despite these, #FeesMustFall and #ZumaMustFall are inaugurating a new historical vector for mass power and democratisation from below, notwithstanding Zuma falling, or being predictably defended by a deeply corrupt ruling party. Brigalia Bam, former chairperson of the Independent Electoral Commission (IEC) and author of Democracy – More Than Just Elections, has written a response to the way in which the Mail & Guardian reported on the first of former president Thabo Mbeki’s series of articles on the period of his presidency. Bam is Chair of the Board of the Thabo Mbeki Foundation. The article in question was published on Thabo Mbeki’s Facebook Page on January 11. In the article, entitled “The tragedy of history: When caricature displaces the truth”, Mbeki addresses the documentation of the struggle and the subsequent “characterisation” of leaders of the liberation movement. 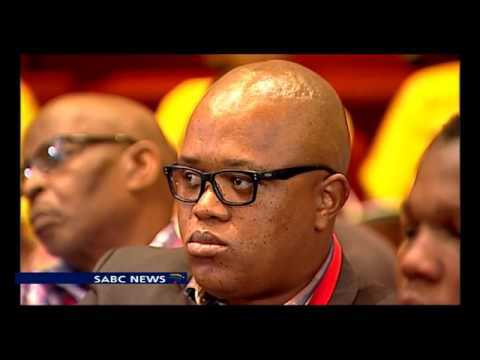 He refers specifically to the controversy related to Minister of Safety and Security, the late Steve Tshwete. For various reasons many of us who were directly involved in our struggle for liberation have not taken the time to write about this struggle and the subsequent efforts to build a democratic, non-racial and non-sexist South Africa. One result of this is that people who were essentially observers of both these periods have written much of what has been published about these times, a good part of which has come to be accepted as authoritative and definitive, with no suggestion whatsoever that the authors of these supposedly authoritative and definitive histories had their own political or ideological mind-sets. Some of this writing has sought to define my character as I served as President of the ANC and the Republic, and argued that this characterisation helps to explain various developments during this period. For all his reputation as being aloof and unaccountable, we always had at least some idea of what Thabo Mbeki was thinking during his time as president. Not always a clear idea, mind you; his use of impenetrable allusions and convoluted logic caused us a fair bit of head scratching. We had something to work with, though. Regular as clockwork there would be a lengthy essay in the ANC Today online newsletter, or a long academic speech to unpick. Mbeki was never a Twitter-length politician. In her article, also published on Mbeki’s Facebook Page, Bam explains the context of Mbeki’s article and questions the newspaper’s response to it. Perhaps reflecting a dry week in the news business, an inability to make sense of so much that is happening in the world around us or just exhibiting an existential crisis of sorts, this week’s edition of the Mail & Guardian led with a piece pretending to be an informed explanation of the first of former President Thabo Mbeki’s articles on the period of his Presidency. Accompanied by a photo-shopped image of the former President donning cowboy regalia and a hunting rifle, the total package (the headlines: “There’s an old sheriff back in town” and “Mbeki is back, with guns blazing,” the photo-shopped image and the article) sought to conjure an image of a vengeful Mbeki on a mission to settle old scores. Reading the story, one imagines a shebeen where all manner of urban legends proliferate. And so, the less said of it, the better. former President Mbeki to stop writing; to shut up! At last, the Mail & Guardian, one of our country’s self-proclaimed defenders of free speech, has let the guard down, revealing its true belief. Freedom of expression applies only to itself and those with whom it agrees! Supposing that we agreed with the Mail & Guardian, are these the reasons for gagging someone in a democratic society? What business are ANC and other political parties’ factional machinations to a paper which professes non-partisanship? Is this an inadvertent admission that the Mail & Guardian is not, after all, as non-partisan as it claims; worst of all that it intervenes in political parties in a factional manner? The baseless charge that “Now Mbeki … shows every sign of wanting to influence South Africa’s path again” is in similar disposition as the Mail & Guardian’s extraordinary desire for a gag on him. No one, certainly not Mbeki, has explicitly stated or remotely implied that the articles are about issues other than those that served on the agenda of public discourse during his Presidency. On December 15 last year, the CEO of the Thabo Mbeki Foundation, Max Boqwana, published a notice on this Page on the “Forthcoming articles by Thabo Mbeki.” Among other things, Boqwana wrote that: “The Thabo Mbeki Foundation (TMF) regularly receives requests from South Africans and others in Africa and abroad asking President Mbeki to comment or speak on a whole variety of issues. In the first article about which the Mail & Guardian complains, Mbeki would confirm that it is the first of many articles to come. Why then does the Mail & Guardian think that Mbeki must not continue to write if his first article does not raise the issues they protest it omitted? In principle, why does the Mail & Guardian think they have a right to determine for him or anyone for that matter, what to write and, by implication, what not to write, especially when the issues are of public interest? Again, the reason can only be that the Mail & Guardian has long determined that Mbeki represents views with which they fundamentally disagree and do not want heard. The perverse reality is that the Mail & Guardian, which pretends to be one of our country’s torchbearers of free speech, is, at the best of times, effectively a Censorship Board, unafraid to gag and to set the agenda of public discourse by means subtle yet no less asphyxiating as those of the Censorship Board of yesteryear. determined by who and why is a change in the interpretation of facts deemed impermissible in a democratic society? violence visited upon those who dared to suggest otherwise. We are indeed in the fortunate position that Mbeki’s articles are being published in a medium other than the pages of the Mail & Guardian. It gives South Africans the opportunity to interpret facts variously and differently from the lenses by which the newspaper interprets them. This surely can’t be a heresy in a democracy! Dr. Brigalia Bam is Chair of the Board of the Thabo Mbeki Foundation. Gallery MOMO in Cape Town recently held a special exhibition of South African artist Dumile Feni’s work, including many never-before-seen pieces. This exhibition rekindled interest in one of South Africa’s most iconic artists, stressing the importance of Chabani Manganyi gripping biography The Beauty of the Line: The Life and Times of Dumile Feni. This book is a celebration of an eminent South African artist, who carved a place for himself, in art circles in South Africa and abroad. The subject of diverse interpretations, Feni was a larger than life figure whose reputation as an artist is evidenced by his captivating sculptures, drawings and sketches. With skilful narration, Manganyi weaves intimate stories from Feni’s friends and acquaintances such as Hugh Masekela, Willie Kgotsisile and Louis Maqhubela, who reflect on his personal challenges and how these impacted on the creative processes behind his artistic flare. 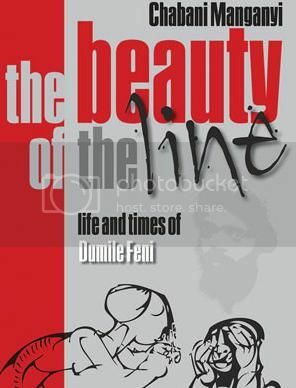 The author’s portrayal of the famed artist will engage and entice the readers into the nooks and crannies of Dumile Feni’s life, and the expressive power of his art. The Centre for Conflict Resolution hosted a public dialogue earlier this year on the role of Chapter Nine institutions: those organisations, as laid out in Chapter Nine of the South African Constitution, which have been set in place to guard democracy. Chapter Nine institutions include the Commission for the Promotion and Protection of the Rights of Cultural, Religious and Linguistic Communities; the Commission for Gender Equality; the Auditor-General; the Electoral Commission; and an independent broadcast regulation authority. The CCR discussion was chaired by Professor Barney Pityana, with speakers Brigalia Bam and Mfanozelwe Shozi attempting to answer the question of whether or not Chapter Nine institutions have fulfilled their constitutional mandate. Bam is the former chairperson of the Independent Electoral Commission (IEC) and the author of Democracy – More Than Just Elections. Reflecting on her years as the head of the IEC, Bam explains the challenges that the IEC have had to face, such as issues of independence, budgets, impartiality and so forth. “Chapter Nine institutions do work that is specialised in a way and we find that in the particular case of the Electoral Commission some people are not familiar with the acts of the commission, with the number of things that we do,” she says, adding that there is much confusion across the board with Chapter Nine institutions on who they are, how they work and what they do. Earlier this week Springbok coach Heyneke Meyer announced that he would not like to be considered as a candidate to coach the national rugby team, effectively resigning from this position. Cosatu welcomes the resignation of Heyneke Meyer and welcomes the opportunity this brings to restore South African Rugby. The Problems in Rugby is much deeper than the coach and it reflects on the entire leadership of the sport. We need to review Oregan Hoskins’ continued tenure as leader also, as he has let transformation down and he must take responsibility for the crisis in Rugby. We won’t let the systemic crisis in Rugby be left intact by the resignation of Heyneke, we want the entire racist, unfair system to change, not just some fall guy to be presented to the media. Cosatu claims this as a victory for transformation and a victory for the efforts of Cosatu on behalf of workers, who include Rugby players. Cosatu will consider retracting its pressure on Corporates to divest from Rugby, if a new leadership and acceptable transformation plan is announced. We ask Corporates to continue applying the pressure to SARU and to not make decisions for investment in SARU, until an acceptable transformation plan is agreed to with the role players. - We call on those who gave up on the black communities’ rugby dreams for the perks and wealth of the positions, to also resign, before we start a campaign to push them out. The time has come to choose a side in Rugby, either you are for transformation, or you stand for perpetuating the apartheid generational advantage of white players in the sport. This nonsense that the racist perpetuate about quota players must also stop, as we have seen that the real quota players are people like Matfield and co.; who clearly are no longer suited to the modern game. Cosatu will not stop its campaign against the leadership and funders of Rugby, until the sport is on a clear and fair trajectory where everyone gets an equal chance. The focus of Cosatu includes players, the administrators and referees of the game. Cosatu will be protesting with the rugby community at the meeting of SARU in Cape TOWN on 11 December 2015, to reinforce our point that it is not only Heyneke that must go, but also some of the leadership of SARU who were complicit in this anti transformation crisis in Rugby. The fact that SARU have tried to hide the venue of the meeting is symptomatic of their refusal to account to the SA rugby community and supporters. We will hold this fact against the leadership of SARU who have become complacent about transformation and now tries to hide from South Africans. Heyneke Meyer has advised the South African Rugby Union (SARU) that he no longer wished to be considered as a candidate to coach the Springboks. Meyer communicated his desire to stand aside to SARU following a recent meeting with Oregan Hoskins, SARU president, and the CEO, Jurie Roux. Meyer said he had decided to stand aside as coach, a decision he considers to be in the best interests of South African rugby, following recent developments. Meyer took over a Springbok team that was fourth in the world rankings at the conclusion of the 2011 Rugby World Cup and lifted them to second (to New Zealand) by the end of his first season in charge. A sculpture by the late Dumile Feni sold for R6 million at the Cape Town Art Fair last year, and a current exhibition of his work, including never-seen-before pieces – turned heads at Gallery MOMO in Cape Town recently. In a piece for Financial Mail, Ashraf Jamal hails Feni’s “visceral, charged, agonistic” art, which he says “captures a prevailing unfinished story of inequality and dehumanisation”. 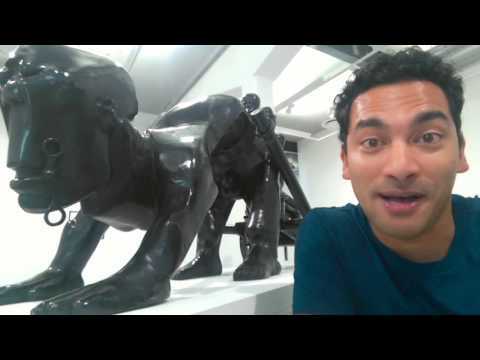 Jamal compares Feni, who died in 1991 of a heart attack in his favourite record store in New York, to both Frantz Fanon and William Kentridge, commenting that despite his “ferocity”, the “Goya of the Townships” is also big business. For art professor Anitra Nettleton, Feni “never seems to have softened his approach in order to pander to the sentimentalist demands of the white-dominated market in SA”. And yet, at this moment in time, one finds a curiously voyeuristic interest in the suffering of others, particularly the suffering of the black body which Feni, through his art, and Frantz Fanon, through his writings, sought to liberate from its chains. One cannot therefore ignore the fact that Feni’s impressively moulded busts, with their high-Modernist sheen, would look very nice indeed in a corporate setting. As for the drawings, they reminded William Kentridge, as a little boy, of “down and out scarecrows. But when you came within a few feet of them they would give you a kick in the guts.” All well and good, but Feni is also big business. Kentridge, after all, was greatly inspired by Feni’s charcoal drawings, though his art has never conveyed Feni’s ferocity. Dr Brigalia Bam dedicated 12 years of her life as the head of the Independent Electoral Commission of South Africa (IEC) and during this time she played a definitive role in elevating the organisation’s reputation and stature. Her appointment at the helm of the IEC in 1999 after the resignation of Judge Johan Kriegler came at a time of great pressure – months before the second democratic elections – and was met with much skepticism and criticism. Bam, however, proved the critics wrong and developed an organisation that was true to its promise of a free and fair election. To read more about this dynamic woman and the inner workings of the IEC, read Bam’s autobiography Democracy – More Than Just Elections, in which she makes a case for electoral reform in post-apartheid South Africa. 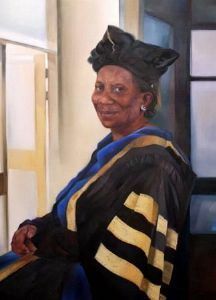 To celebrate the role that Bam played in our democracy, Nelson Mandela Metropolitan University commissioned an oil painting of her from South African artist Rina Badenhorst. The painting sold for $6 526 (about R93 000). Bam was the Chancellor of NMMU when it was still the University of Port Elizabeth and it is thus fitting that her history should be preserved in the halls of the institution. Rina Badenhorst considers herself as a colourist – no light, no colour. The relationships of colour form the backbone of my work and teaching. Over the decades I have developed from strong expressionism in colour to shades of colour, subtleties that translate light.